Anyone know what kind of bird this is??? I need to know what kind of bird this is... I *think* it's just an American Crow - but I'm not positive. I need someone who knows their birds, lol. Umm, I took the pics in MA so it has to be native to there. We have those here where i live but i do not know what they are called. They are really shiny and pretty arent they? I do not think they are crows. Crows are much larger and sturdier. Have you heard them make any noises? Crows go...."ca....ca...ca... ca...". They are very loud! The little shiny ones like the ones pictured that we have here make more of a "cheeeeep, cheeeep, cheeeep" noise. Here is a good bird site. I found the crow but have no idea what to look under for the other one. Last edited by luvnature; 09-12-2007 at 10:18 PM. Chango on Flickr - Photo Sharing! I did kind of think they looked like the pictures of American Crows. for example, they look at least douple the size of a sparrow and if you see in second picture the black one compared to the sparrow. I thought crows were smaller and ravens were the really big ones? I found it on the column on the left..under...Blackbirds Makes sense! These look like the ones we have here. I know that the males are always really shiny, almost shine bluish in the sunlight...and the females are a dull black. Sometimes a little bit brownish black looking. Ravens are larger than crows, your right. Last edited by luvnature; 09-12-2007 at 10:34 PM. Maybe that is what it is - I'll look into it, thanks! I actually thought it was that before but didn't think it looked colorful enough. 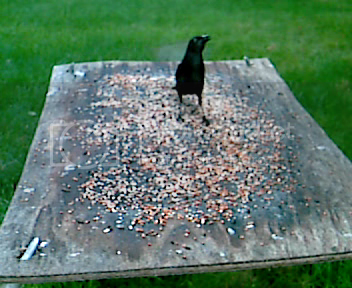 I think maybe they might be grackles that just arn't as colorful as some of the ones in pictures. 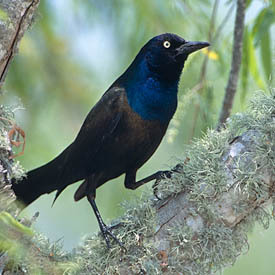 I looked up how grackles sound online and those birds do sound more like grackles then crows but they don't sound exactly like the calls I listened to online - they don't sound as high pitched. So everyone thinks their grackles and now crows?? 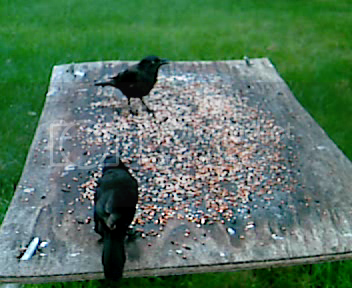 I think they are Common Grackles. They might be related to crows as Padfoot stated. Its a pretty Blackbird of some sort whatever it is! I took the pictures in to one of my bio professors who studies birds and they are indeed common grackles! 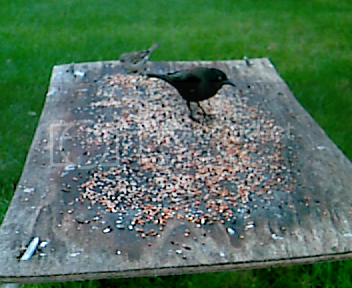 its hard to tell the difference in the first and last pic, but if the bird in the center pic is the same as the others, then I think what you have here is a fledgling (juvenile) Grackle, which basically looks like a common blackbird. They have the iridescent coat, and the way to tell the difference is they have a longer slimmer and slightly curved beak on them, whereas the blackbirds beak is a little shorter and stouter, or fatter looking. The middle pic definitely looks like a grackle's beak. They can be very aggressive birds if you get too close to their nests, and are usually the ones you see dive bombing other animals and even people.